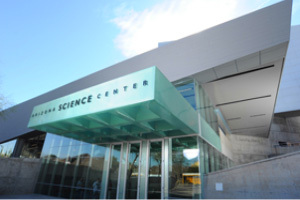 The Arizona Science Center has a rich history of exploration, innovation and collaboration. Beginning as a community project of The Junior League of Phoenix in 1980, the Center has established itself as a major institution of learning for families, teachers and students and other guests. Over three decades, with substantial help from the citizens of Phoenix and years of focused content and program development, the Center has grown to serve over a half million guests annually, of which nearly 140,000 are school children. The continued growth of the Center and its close connection with the Arizona community provides a unique experience for everyone it reaches. Using an informal, hands-on approach to science exploration and inspiration the Center has more than 164,000 square-feet of space, of which 98,000 is dedicated to the exploration of our guests. Additional learning opportunities and services include outreach programs, focused field trips, camps, classes, to-the-moon and beyond presentation in the Dorrance Planetarium, immersive shows in the 5-story IMAX® Theater and featured exhibitions. Explore More than 300 Hands-on Exhibits in 7 Themed Galleries. With so much to do and see, the only question is: Where to begin? Plan your day right here. Arizona Science Center houses four levels of exciting hands-on exhibits, a state-of-the-art planetarium, and a five-story-high IMAX® theater.